2 drawings on paper (1 sheet) : ink ; top image 4.25 x 3.375 in., bottom image 5.25 6 in., on sheet 9.5 x 6 in. Ink sketches of a man reciting a rokyoku story and a Kabuki play with three women and a man in kimono. Top sketch of a man, Shigetomo Kimura, standing behind a podium with mouth open and eyes closed as he recites a story. Bottom sketch of a man standing on a veranda with mountains in the background ; three women are seated in front of him dressed in kimono. 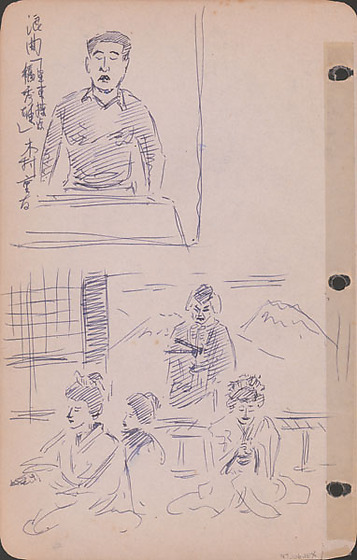 Image is similar to sketches on 97.106.1EW of Kabuki performance on February 1, 1943. Drawing 97.106.1EW on recto of same sheet. Written in black ink, top left (In Japanese): Rokyoku "[unreadable]" Kimura Shigetomo.